The 2015 Terror Dave Road Trip beings! There comes a time in everyone’s life when you just plain need a vacation! We Terror Daves are no exception as the responsibilities of our daily lives have kept us hopping these past months; inadvertently driving our attention away from this blog. Thankfully the site has been doing pretty well despite our blatant neglect and we’re hopeful this year will see a brand new Dave a Dawning (so to speak). After all, behind Terror from Beyond the Daves is a friendship between two fanboys who share many diverse interests; many of which explored on this site. Our eclectic tastes have transferred over to our road trips. The first few times we got together (for those unaware, I live in Chicago while the other Dave is in Rhode Island) our visits always revolved around horror conventions; specifically Rock n Shock in New England and the March Horrorhound Weekend here in the Midwest. In 2011, I suggested David get involved with his local zoo since we’re both animal lovers and I’d been affiliated with Chicago’s Brookfield Zoo since 1999. He would heed my advice and later became employed at The Roger Williams Park Zoo in Rhode Island before returning the favor by inspiring me to get involved with AAZK (American Association of Zookeepers). This would provide me with yet another avenue to devote my animal interests; specifically elephant and rhino conservation. David A.: This was one vacation I was really looking forward to. In the three years I’ve been working at my zoo (I volunteered for a year before becoming a full-time employee) we’d never experienced a winter like the one we just had. It was weekly snowstorms garnering at least a foot of snow each week and, as it was my responsibility to keep the zoo clear of it, had taken a big toll on my body. Not only was I having back issues but also tendon problems in my right elbow…ouch! A vacation, especially with the possibility of warm weather, was exactly what I needed. Though not thrilled to have to get up at 4 AM for the airport, I knew I was in for an amazing adventure! Dave F.: David flew into Chicago early on Thursday March 26th. I hopped out of my car and before giving him a big hug said, “Hail Hydra!” (which somehow seemed a lot funnier on the drive up). We headed out to Elgin, Illinois which had ironically been one of our first destinations last year when we visited Acme Design (story HERE). 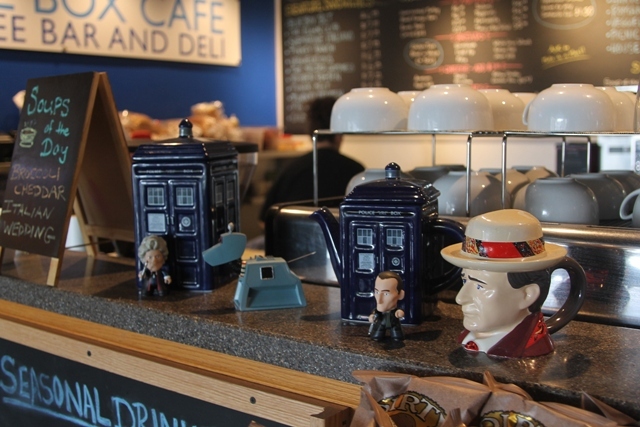 This year we decided to kick things off by visiting a Dr. WHO themed restaurant called the Blue Box Café. 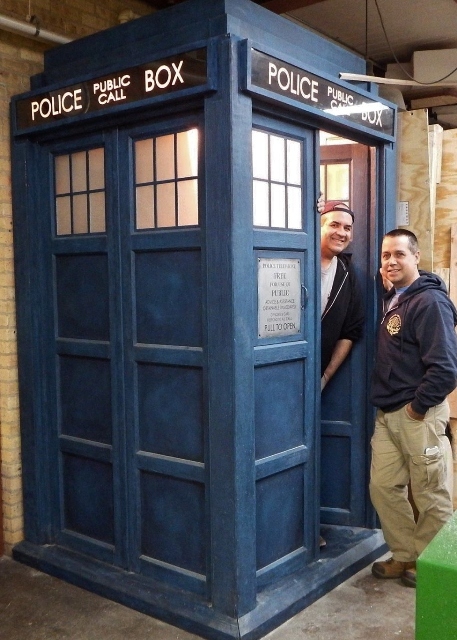 The “Blue Box,” of course, being a reference to the Tardis; Doctor WHO’s space traveling, time machine which outwardly appears as an old British Police Box. David and I both love Dr. WHO so there was no way we were going to pass this up. Dave A. The plane arrived early and, being in desperate need of caffeine and grub, we drove straight to the café from the airport. I remember watching Doctor WHO in the 70’s, during Tom Baker’s incarnation when the show aired every afternoon at 4 PM on one of our local stations. While I did think it was cheesy at times, the monsters were cool and I enjoyed it. It took me many years to get back into it but, thanks to Netflix streaming, it didn’t take me long to fall back in love with it. Dave F.: As we approached the café it occurred to me that I’d been to this spot before. 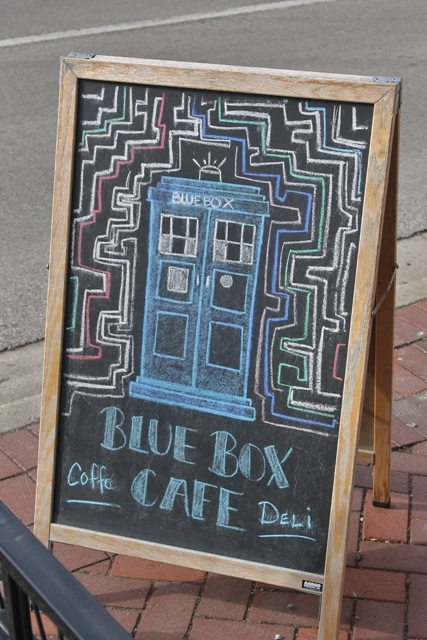 It had previously been “Ravenheart Coffee” – the spot I’d met my friends during my first visit to Elgin’s “Nightmare on Chicago Street.” Outside was a blue bench and chalk drawing of the Tardis proving that we’d definitely found the right place! David A.: One of the most fun aspects of our road trips is that you never know what you’re going to experience. A particular place of interest may look good on paper but prove disappointing once you get there. Our first stop was far from a waste of time! Everything about the place was perfect and the theme, while obvious, wasn’t overdone. Yes, there were references throughout; including the show playing on flat screen TV’s, but it never overwhelming. The environment was welcoming to all patrons, WHO fans or not, and a nice place to eat, commune with friends, enjoy delicious food, utilize the free WI-FI, or just plain relax. 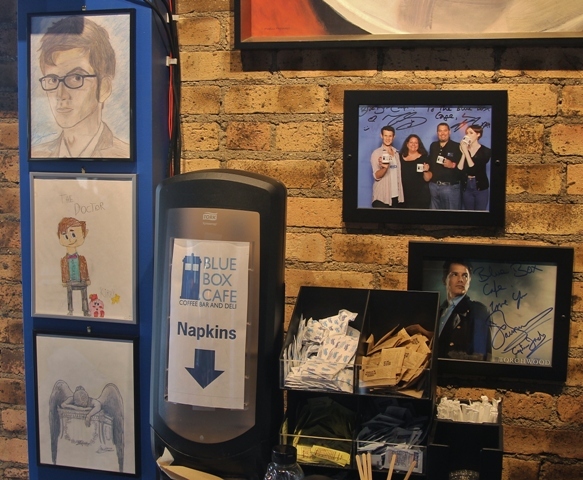 From autographed pictures on the walls to Blue Box Café t-shirts, this place had it all! Dave F. The owner, Chris Mau, was very friendly and I asked him if he sold “Jelly Babies” which were featured in the old Dr. WHO series. He said that importing those in from Europe was quite expensive but he’s done it for special occasions. 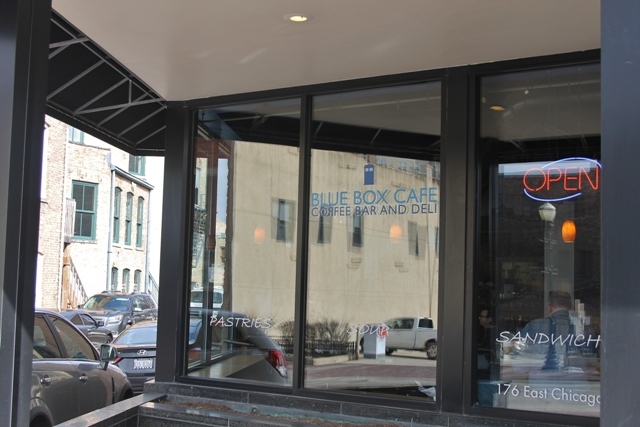 David and I both ordered the “Blue Box BLT” before walking around and taking more pictures. 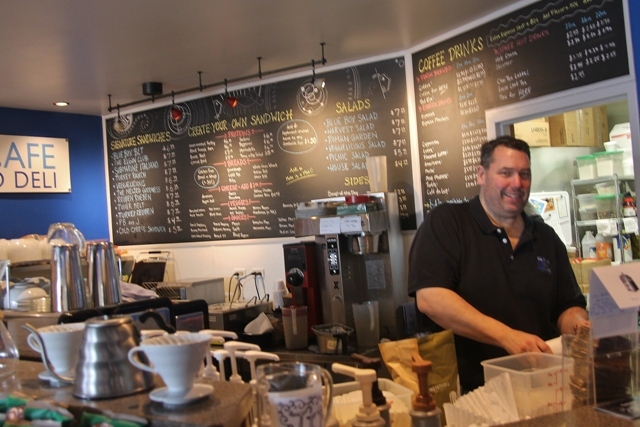 David A.: The food, though not extravagant, was tasty and fairly priced. Dave and I both decided on the BLT for our late breakfast. It didn’t take long to get the food and, for me (who had been up since 4am and running on airplane peanuts), it really hit the spot! One of my favorite parts of the whole place was along the back wall where they had a large façade of the TARDIS. 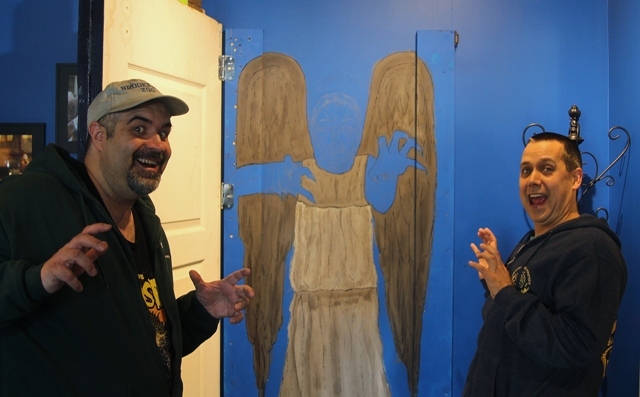 It turned out this was actually a door that, when opened, revealed a painting of the Weeping Angels; reoccurring villains from the WHO series. This painting was not yet complete but still afforded us a great photo op (and reason to come back). 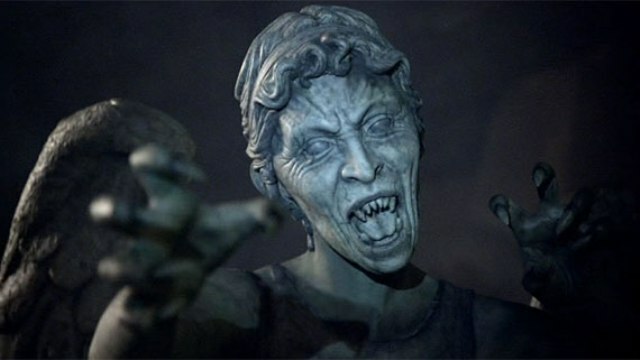 For those unfamiliar, the Weeping Angels are aliens that look like the crying angel statues you might find in a cemetery. As long as you are looking at them they can’t harm move nor harm you. Once you look away, however, they can move at lightning speeds. Their first appearance in the episode “Blink,” remains one of the greatest in Doctor WHO history. There’s good reason the episode is titled “Blink” because, if you do, you’re dead! Dave F. The rest of the day we’d spend at Brookfield Zoo where David would get some behind the scenes tours before my AAZK Chapter prepared for a fundraiser dinner featuring the one and only…Svengoolie! Remember how I said it was great doing things that catered to all our interests? Day One was proof positive! Coming up…Metaluna Monsters, Tigers, and Bears, Oh My! 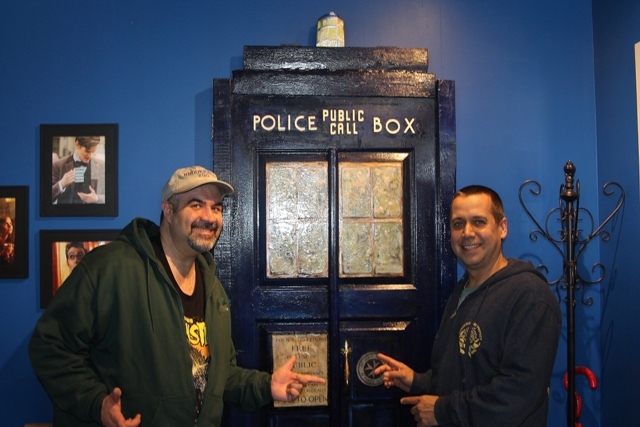 This entry was posted in Science Fiction, Terror Daves on the Road!, Weird USA and tagged Blue Box Cafe, DR. WHO, Weeping Angels. Bookmark the permalink. ← The Amazing Mask Collection of Scott Solomon!